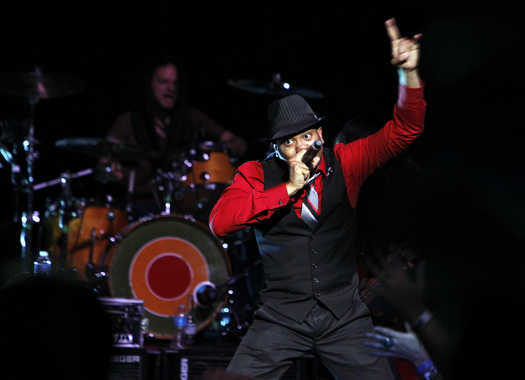 Dance ensemble Thievery Corporation took fans around the world and through its considerable catalog during its inaugural performance in Kansas City on Wednesday night at the Midland. Although Thievery Corporation functions as a duo in the studio, onstage CEOs Rob Garza (turntables and keyboards) and Eric Hilton (guitar) expanded the board to include a horn section, a full rhythm section and a division of vocalists. Boston MC Mr. Lif brought a hard energy to “Culture of Fear” while mid-Atlantic Rastafarians Ras Puma and Sleepy Wonder imported Jamaican riddims and patois to “Overstand” and “Amerimacka.” Nearly every singer was onstage jumping around during the powerful “Warning Shots.” Many of the best moments, however, belonged to the women. “Garden State” soundtrack staple “Lebanese Blonde” featured Natalia Clavier’s silver tongue paired with Hilton’s sitar. French singer LouLou delivered a spellbinding “La Femme Parallel” in her native tongue. LouLou also was featured in the most organic moment of the night, when Hilton and Garza strapped on six-strings for the ballad “Sweet Tides.”Despite the globetrotting nature of the night, many of the songs featured similar downtempo beats and relied on textures to keep them fresh. As the band moved through trance, bossa nova and dub, detours into reggae, hip-hop and dancehall were welcome. “Vampires,” an anti-International Money Fund screed set to Afro-Beat, was especially energetic. I’m not sure whether the political message got through, but it was hard to find anyone not dancing. The small crowd fit comfortably on the first three tiers of the Midland floor. The engaged crowd made the most of the ample space, letting the music inspire large, sweeping dances with plenty of room to move around. With no backdrop and a basic light show, Thievery Corporation relied on its music to inspire the audience, and it definitely worked. The constant movements seemed to close in the cavernous room and make it feel more full and energetic. With the band and audience in complete simpatico, it seemed a little soon when the musicians called it a night after nearly two hours. It felt as though the spell could have lasted all night, especially given how long many fans had waited. It took 15 years and seven albums for the band to finally find Kansas City. Hopefully it won’t take that long for it to come back.